Samsung has launched Note 7 smartphone under its Note series. Samsung Note 7 is an IP68 rated smartphone having a 5.7” Dual edge Super AMOLED screen with a resolution of 2560×1440 (Quad HD) and colour depth of 16M. In USA Note 7 runs on Snapdragon 820 configured as Dual-core 2.15GHz kryo + Dual-core 1.6GHz kryo with Adreno 530 for graphics processing. The international variant of the Note 7 will come with Exynos 8890 configured as Quad-core 2.3GHz and Quad-core 1.6GHz with Mali-T880 MP12. Samsung Note 7 comes with 4GB of RAM and 64GB of internal memory which can be further expanded up to 256GB using a microSD card. For photography Note 7 is equipped with 12MP Dual Pixel sensor for main camera (rear) which can record videos up to 3840 x 2160 (UHD 4K) with auto focus and flash. The front camera has a 5MP CMOS sensor which can record videos up to 1920 x 1080 (FHD). Note 7 is powered by 3500mAh battery with a CDMA talk time of 38 hours and video play time of 18 hours. The most important feature launched with the phone is Iris scanner however, Note 7 also comes with a Fingerprint sensor. All the important sensors required for a Flagship phone are embedded in the phone and Note 7 supports all Samsung Gear accessories (Gear Fit, Gear Fit2, Gear 1, Gear2, Gear2 Neo, Gear S, gear S2, Gear Icon X, Gear VR, Gear 360). Note 7 was the most awaited smartphone from Samsung after the success of Galaxy S7 and S7 Edge. 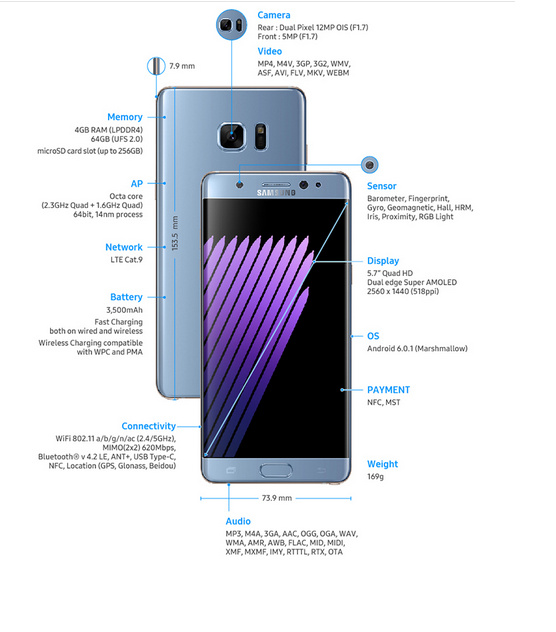 Note 7 has many similarities with the S7 Edge in terms of memory and processor. The major difference is a big screen and an Iris scanner in Note7 but we have to see how fast it can unlock the phone. Galaxy S7 and S7 edge are the two phones which has brought Samsung back in the market and the company is on a right way from what we have seen today with the launch of Note 7. No another phone is currently seen as a competition to these Samsung Flagship phones Oneplus 3 might be an option but a curved edge screen with Quad HD screen is worth the price and phone looks stunning. The S7 was said to be the best phone when it was launched during the CES. Currently, New Nexus phones are on their way for the launch with Android 7.0 Nougat let’s see what happens next.